From initially just watching the video, I assumed that they had fallen in love with someone who is very obliging. However, even though they have a great time, the “lion man” moves onto someone else, but still gives the promise of being with them. And then at the end we see that the “lion man’s” plan is stupid (I mean who invites 8 women to the same meetup spot :p) and that even though the “lion man” tries to get with them again, the women are angry/upset. 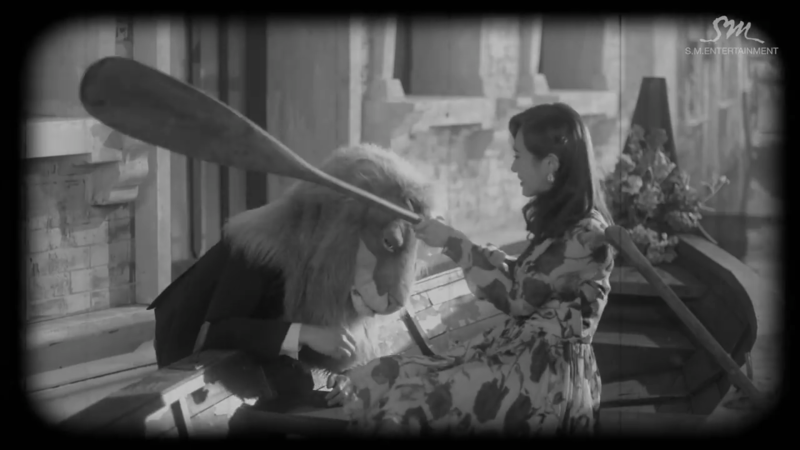 After looking at the lyrics (which you can see here) I understand that the “lion” part, is that the “lion man” looked at them like prey and that the women all want to tame his “lion” heart. I thought this part of the video became more clear after I read the lyrics. However, the lyrics give me the impression that they knew about the “other women” and how the “lion man” was not as great as they initially thought. I felt that didn’t really come across well in the video. The costumes in this video were great. I especially loved the costumes they wore in the little individual skits and also during the dance section in the train station waiting area. I wasn’t overly in love with the “ballroom” outfit or stage because I thought it wasn’t as fitting as it could have been. However, I don’t think it ruined the overall look of the video. Talking of sets, I particularly loved Hyoyeon’s little grass set, that and her overall outfit made me so happy! 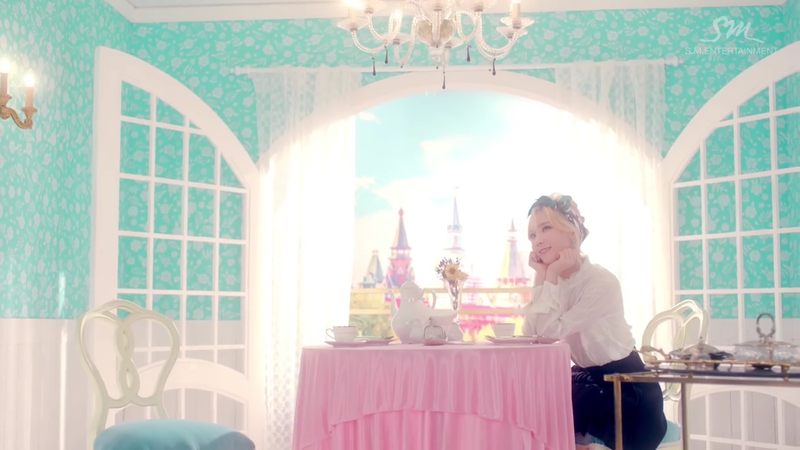 Also Taeyeon’s cute “French cafe” set was beautiful and she looked stunning in her outfits. I also enjoyed that after the women found out about everyone else, the video went black to kind of match the sorrow of the women. However, it also had a comedic black and white silent film quality which I find really funny and cute. The little openers to each section also gave it a rather film feel and I enjoyed those, they added a cute quirkiness to the already cute production. I really enjoyed how this song opened, Taeyeon’s vocals are always spot on and enjoyable. 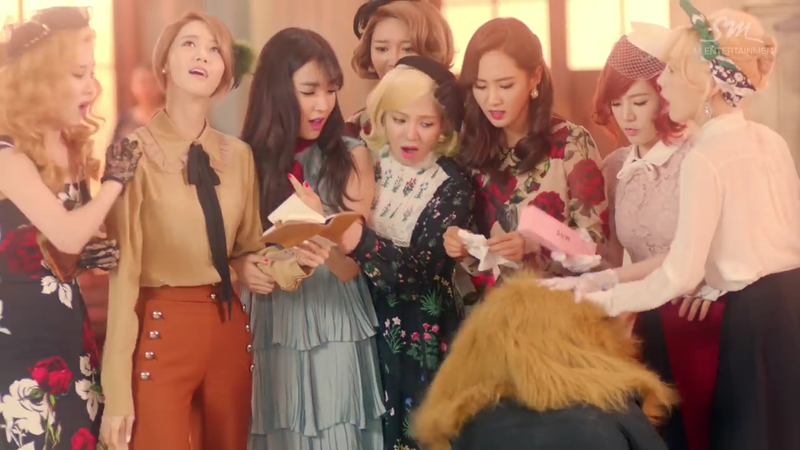 It was nice to see the others singing, I may just not listen too closely, but I’ve recently seen that Hyoyeon, Yoona and Sooyoung are getting adequate amounts of lines. However, I will say I felt this song heavily relied on Taeyeon, Seohyun and Tiffany. And before people start, I do realise that they are the main/lead vocalists, but I would like it if the others were given more of a chance to get lines. But being 8 members and only having 3-4 mins, I realise that can be a struggle. Also, the chorus is fun and the vocals are great throughout. I really like the dance for this song. I especially liked the parts where they were interacting and there was a general air of happiness and fun. This happens near the end of the MV, in both the “ballroom” and the “train station” sets. 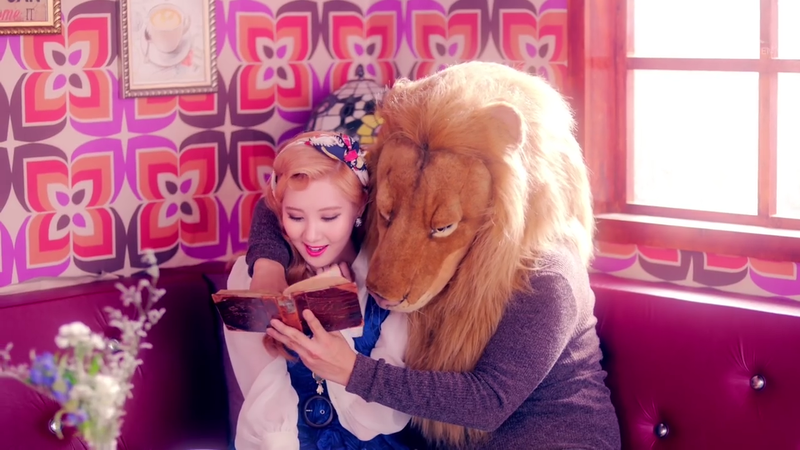 The chorus dance move with the cute paw movement when they sing “lion heart” was great, I really enjoyed that and seeing Seohyun do it just made me smile so much (SeoBaby is so cute~).